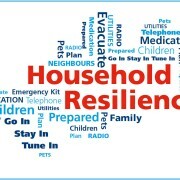 Annan Community Council have adopted a community resilience plan for Annan. Since the mid 1980’s the United Kingdom has been affected by various natural and technological disasters all of which to a greater or lesser extent have impacted on local communities. In case of a disaster the community should be prepared and the Community Council has taken on the role of organising this plan. The aim of the plan is to increase resilience within the local community through the development of robust co-ordinated arrangements that compliment those of responding agencies. The Rotary Club of Annan has offered assistance and we would appreciate help from other local groups. We do need offers of tractors, four wheel drive vehicles, etc. In the event of an incident in Dumfries and Galloway, it may be some time before the emergency services can help you, making it very important that you and your family have made the necessary preparations to take care of yourselves. As an individual, household or family, agree on a plan in advance. Complete the attached Household Emergency Leaflet and keep it safe should you need to use it.